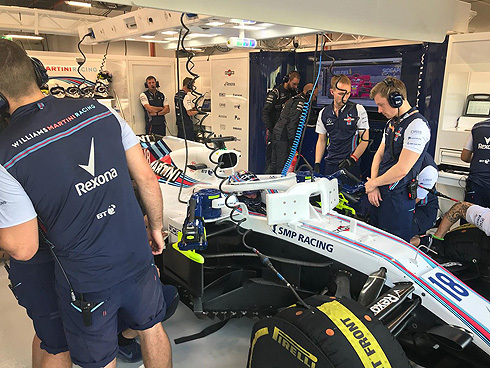 The opening Friday practioce for the 2018 Singapore GP would see the Williams Martini team finish well down the order with their drivers in 18th and 19th. 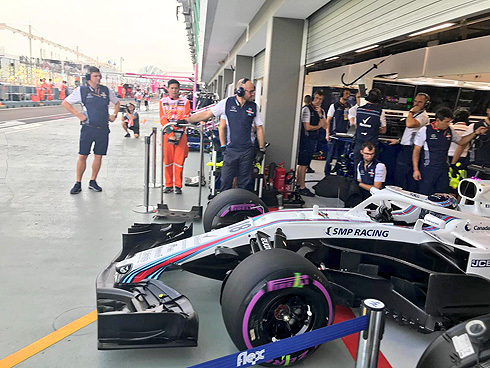 Lance Stroll would lead team-mate Sergey Sirotkin in what was a uneventful session wth the only moment been a spin from Lance early in the session. Both drivers would only use the ultrasoft tyre during the session. With the start of the opening Friday practice for the 2018 Singapore GP both Williams drivers would come out early and after the opening series of runs it would be Bottas who was quickest with a 1m:43.428, using the ultrasoft tyre followed by Vettel, hypersoft, and Verstappen on the soft. The Williams pair were seventh and eighth but both would drop down the order and even with improved times would be 10th and 12th with twenty five minutes of the session completed. At the front it was Bottas, 1m:42.170, followed by Hamilton and Vettel. Verstappen was now fourth followed by Raikkonen, Ricciardo, Hulkenberg, Perez, Sainz and Alonso tenth. With thirty minutes completed the Williams drivers were 16th and 17th. Hamilton had now gone quickest with a 1m:42.072 with Bottas second now followed by Verstappen and Ricciardo. Ricciardo would be able to move ahead of Hamilton with a time of 1m:41.814 while Perez was now fifth. The track would empty as drivers returned to their pits to return the extra set of Pirelli tyres. After their next runs the Williams drivers would be 13th and 14th. At the front the Ferrari drivers both using the hypersoft tyre would go first and second with Vettel quickest with a 1m:39.997. The Williams drivers were now 16th and 17th with just under thirty minutes remaining in the session. Verstappen would move into second using the hypersoft tyre followed by Raikkonen, Hamilton, Sainz, Bottas, Hulkenberg, Ericsson, and Perez now 10th. Ricciardo would use the hypersoft tyre and would set a 1m:39.711 to be quickest with Vettel second. Now the Williams drivers were 18th and 19th but yet to try an hypersoft tyre run. Leclerc was now ninth with twenty minutes of the session remaining. Both Williams drivers were back out with ten minutes remaining still on the ultrasoft tyre and not looking like they would use the hypersoft. With the end of the session the order would be Ricciardo from Verstappen, Vettel, Raikkonen, Hulkenberg, Hamilton, Sainz, Bottas, Leclerc and Grosjean in tenth. Of the top ten only the Mercedes drivers had yet to use the hypersoft tyre. 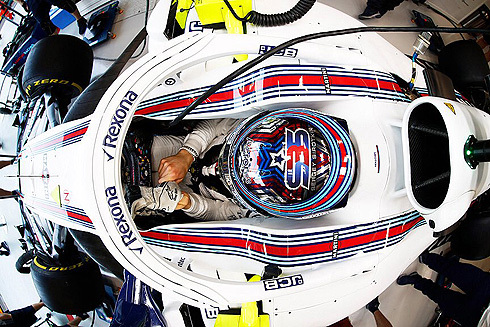 As for Williams they would finish in 18th and 19th having stuck to the ultrasoft tyre for the whole session. Lance had also come out for his first run using the ultrasoft tyre and would drop down to eighth behind his team-mate. But Lance would improve with a time of 1m:47.699 but he would drop to be 11th. A 1m:46.889 would see Lance improve but again he would drop down the order to be eleventh with twenty minutes of the session completed. Early on in the session Lance had a spin at Turn 2 but was able to continue. A 1m:45.887 would see Lance tenth but he was currently thirteenth. Lance would also pit and would drop to 17th having completed twelve laps. Lance would also return on a new set of ultrasoft tyres. Lance woudl also improve with a 1m:43.849 to now be 13th. He would drop down to be 16th having pitted after a seven lap run. Lance would again return still running the used ultrasoft tyre. Again his car would be seen with flow-viz on the rear wing. He would complete the session remaining in 18th. Sergey would take to the track running on the ultrasoft tyre and would briefly be first on the times but he would drop down to seventh with a time of 1m:47.961, one place ahead of his team-mate. Sergey would improve with a time of 1m:46.231 to be seventh dropping to eighth. Sergey would continue a long run on the ultrasoft tyre pitting after an eleven lap run and in the pits would drop to 17th. This would become 18th. He would drop to the bottom of the times to be behind the Sauber's. Sergey would return with a set of ultrasoft tyres and would set a 1m:44.036 to now be 12th. This would become 14th one place behind his team-mate. Sergey would also drop down the times to be 17th having pitted after a six lap run. Sergey's next run would be with fifteen minutes remaining and he would again come out on used ultrasoft tyre. Like his team-mate he would complete the session remaining in 19th.